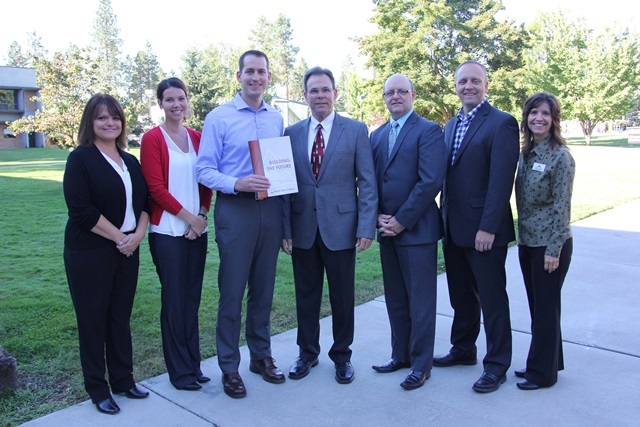 Pictured are, from left: Kelly Hagen, INB Spirit Lake branch manager; Jessica Chavolla, INB Coeur d’Alene branch manager; Laszlo Suto, INB commercial banker; NIC President Rick MacLennan; Steve Speer, INB Hayden branch manager; Rob Parkinson, INB North Idaho Commercial Banking team leader, and Rayelle Anderson, NIC Foundation executive director. INB has committed $25,000 to North Idaho College’s Building the Future campaign to provide the necessary equipment for expansion of programs in NIC’s brand new career and technical education facility in Rathdrum. The 110,960-square-foot facility at 7064 W. Lancaster Road in Rathdrum (next to Kootenai Technical Education Campus) opened for classes this fall. The facility was built with $15 million from college capital funds coupled with donations secured through the “Building the Future” capital campaign, which will fund necessary equipment to expand trades and industry programs at the new location and enhance student scholarship support for trades and industry students who might not otherwise have the resources to pursue a career in these fields. The goal of the campaign is $5 million and $4.6 million has already been secured. Commemorative naming opportunities are still available for donations of $1,000 or more. To learn more about how to support the Building the Future campaign, contact the North Idaho College Foundation at (208) 769-5978 or foundation@nic.edu, or, visit www.nic.edu/buildingthefuture.